Courtesy of Ianvisits - plans to upgrade and expand Leyton Tube station. Looks interesting but will be a shame to lose the use of the existing ticket hall. Will also make interchange to / from buses marginally more involved than now. It is honestly amazing the amount of passengers that get off of the Central Line at Leyton at all times of the day. Only just on Saturday during my journey Night Tube, I saw so many people streaming out of the Central Line. The only problem it does not change the situation of full platforms and overcrowding on the train during AM peak. It will at least have a good effect on egress times during PM peak. As it’s my local station, be lovely if it actually happens. Thanks for the link to the article. I’m either being dumb this morning or into day 2 of being signed off work ... but how does it make the interchange to buses more complex? The new emtrance is literally to the side of the ticket hall, looking like where the bike shed/outside staircase is. Not going to make a dent in the walking route to the stops. It's obviously very marginal but it's a longer walk overall from bus stop to platform from the Stratford bound bus stop. You'll have to walk down the other side of the bridge slightly then about half way along the platform before reaching the overbridge to take you down to the platform. Also the pedestrian crossing on the bridge is right outside the current station building so if you want Bakers Arms / Walthamstow it's an almost direct line dash. In future people will have to head up the bridge - walking directly into those walking *to* the station from the stratford side. They then effectively have to double back on themselves having crossed the road. In terms of the "principle of least effort" or "direct walking routes" it's not very sensible. You know what people are like when they're in a hurry. You also know, as a local, how horrendous the queues are for buses at Leyton station. I just think making things even marginally more difficult / lengthy doesn't really help because people will try to find a way round what they perceive as a difficulty and then means pushing and shoving / fighting over pavement space and leaping over roadside barriers (if fit enough). Interchanging at Leyton already feels "fenced in" when it is busy. This new design (IMO) doesn't ease that issue apart from within part of the station itself. Thanks, of course the factor with the road and pavement outside is they haven’t mini Hollanded it yet. You never know, LBWF might actually have thought about that and have a joined-up view of how to make it line up to the new station. Sorry. Fuzzy sick brain again, of course they haven’t, this is Waltham Forest. 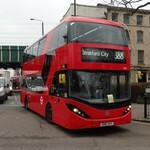 Is Leyton, Downsell road (or an equivalent) still available as a bus turn? This used to be a very useful turning point in peaks, from the Leyton Green direction in particular, before Stratford Station became so strategically important with the creation of DLR and the Jubilee Line extension. There was a masterplan last year which I believe mentioned decking over the A12 to allow better access into the current retail park area (to be converted into housing/ retail) and improving the pedestrian crossing on the bridge (which i assume means widening?). Yes - although no longer a terminus since the 97 was extended to Stratford City, it is still available as a turn and bus stand. Route 241 used it between June and September 2012 when Stratford City Bus Station was cordoned off during the Olympic and Paralympic Games. Downsell Road was originally a trolleybus turning point. Before the opening of the Central Line the majority of short workings were from the South, but the opening of the Central Line at Leyton turned this on its head, with short workings from the north acting as feeders into the new Underground line. Some peak-hour 555s were also extended from Bakers Arms to Downsell Road. 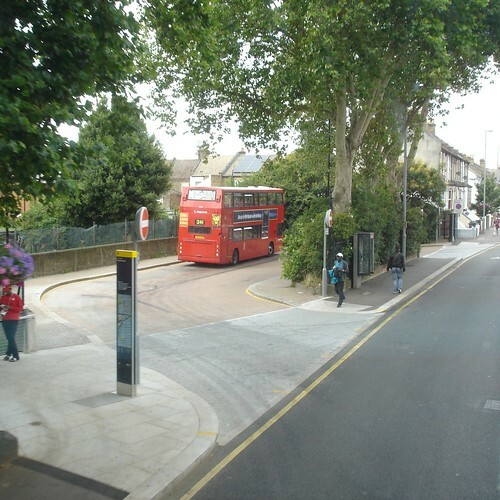 The N205 which terminates at Downsell Road, still stands there. Thanks - I'd forgotten about the N205! Looking at the artist impression, it is where the old car park used to be, before it was obliterated when the M11 link road (A12) was constructed. Thanks for the confirmation - I remember the 34 being extended there in the peaks, which I think is the furthest south it's ever been, and loads of 69 shorts worked by Leyton garage when that was a proper route i.e. Chingford to North Woolwich. 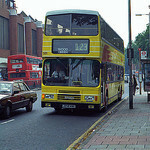 When the 34 was extended from the Crooked Billet in the 60s,didn't it terminate at Downsell Rd? Yes, according to Ian Armstrong's site it terminated at Downsell Road during Mon-Fri peaks (and Sat pm for a few years); at other times it only ran to Leyton Green. This lasted until 1973 when the route was diverted to Harrow Green via Whipps Cross. If you go further back in time the route started out as Stratford - Whetstone.